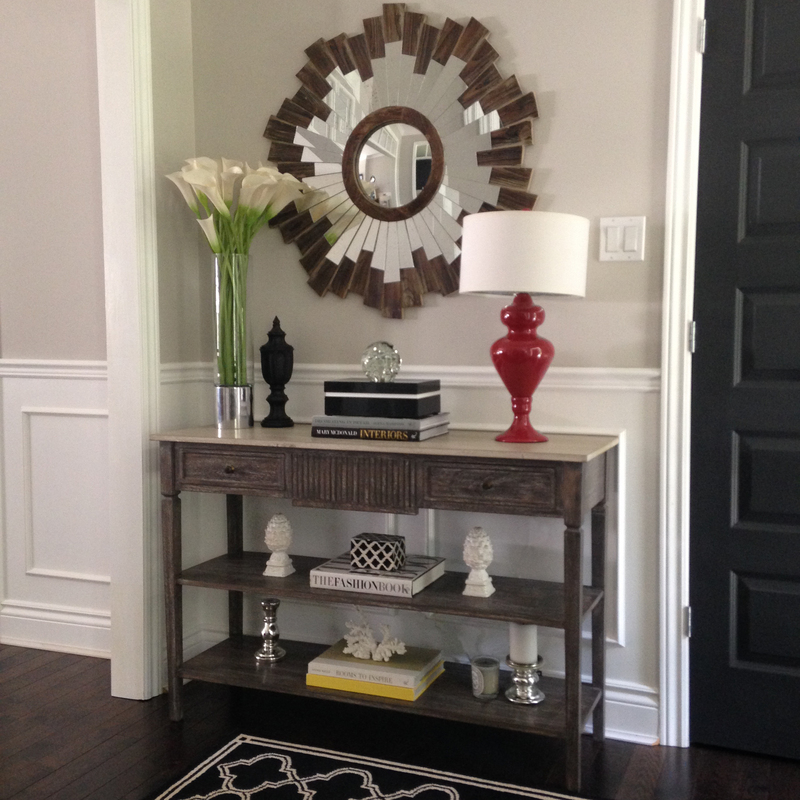 So I’ve decided to show you some photos of one of my favorite spots in the house – our entry way featuring the console table. I wanted to give you an idea of how certain things can dramatically change the look of a space. I do love both looks here, I think my taste has just grown up a little. Knowing myself however, this spot could end up changing again. There’s such a thrill to seek out the perfect item you’re on the hunt for! This table is an old table that was in my parents house when we moved into it 30 some years ago. I stole it from them one day and threw on a bold turquoise color, wanting to make a big statement. It came with us from house to house and landed here, in our entrance way. I’ve loved this table for so long! It’s missing handles and has a big split down the middle – it’s supposed to have 10 leaves or some crazy number – but I love the details of the wood work. And the color is so happy! I recently put it in my daughter’s room as a desk and it is quite fabulous in it’s new spot…I’ll have to post that some other time! 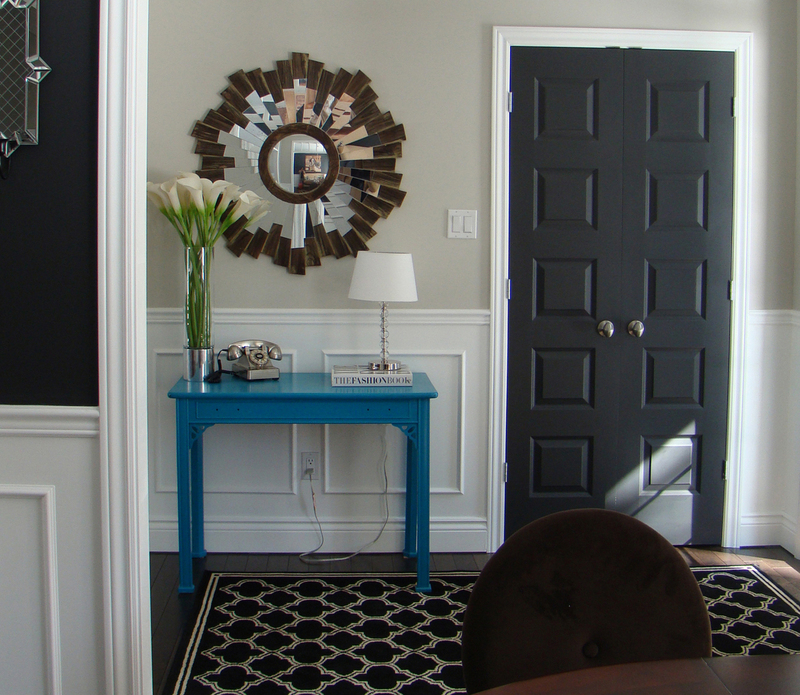 This is now – I wanted a more subdued and sophisticated look to go with the mirror above it. Although there still is that little hit of drama that I love with the red lamp, another one of my favorite finds. Back to the table – I SO love this table I cannot tell you enough. I could not be more happy with it and how it elevates the look of the space! The shelves are ideal for all my books and things…by the way, do you recognize anything here? I told you I’m always redecorating! I may have to do some shopping – one can never have too many design books (or boxes! )!